Thank you to those of you who joined this year's Veridian workshop in Chicago. We love seeing you all and chatting about your projects and plans. For those who didn't join the workshop, we are planning to set up a few webinars towards the end of this year. Please feel free to email us and suggest any topics that you are interested in. In this month's newsletter we are giving a case study of the Central Michigan University project - this gives you some idea of the issues you are likely to face if you are considering replacing your CONTENTdm system. After that, a quick peek at our new user interface, which we will talk more about next month. "We were expecting the conversion process to Veridian to be more complex and time consuming, but it was surprisingly painless" - this is the feedback we got from our Central Michigan University project leaders. Read more about our experience with CMU and see how Veridian helped CMU convert their existing CONTENTdm collections into Veridian and the benefits behind their conversion --- read the full story here. For nearly 50 years, the Clarke Historical Library has been actively preserving Michigan’s historic newspapers through microfilm. 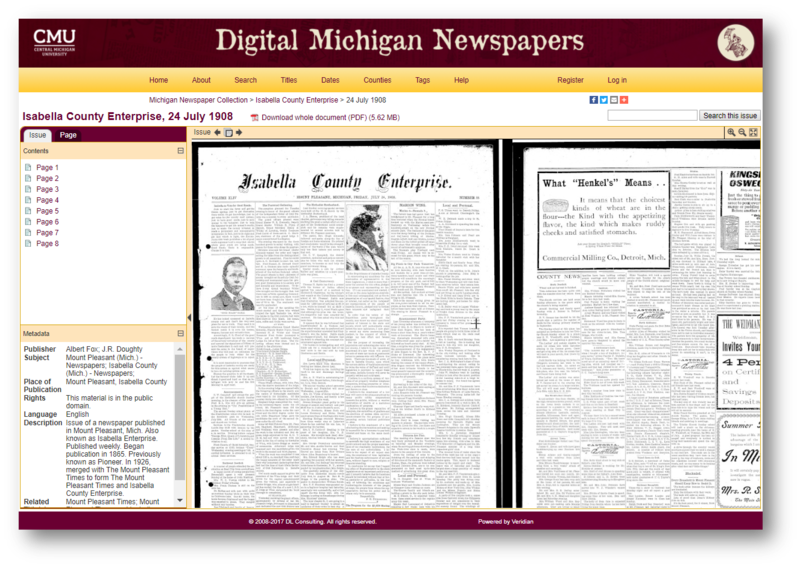 Over the last decade, it has begun to convert the treasure trove of historical newspapers found on microfilm both here and around the state into digital formats that can be accessed on-line. Thousands of pages of local newspapers recording Michigan history as it happened are found here. This collection currently contains 23,427 issues comprising 239,665 pages. Documentation about the history of CMU is found here. The documentation includes a large number of records created by the University and the University’s leadership, such as the minutes of the CMU Board of Trustees and the various Bulletins published annually that describe programs and classes offered at CMU. 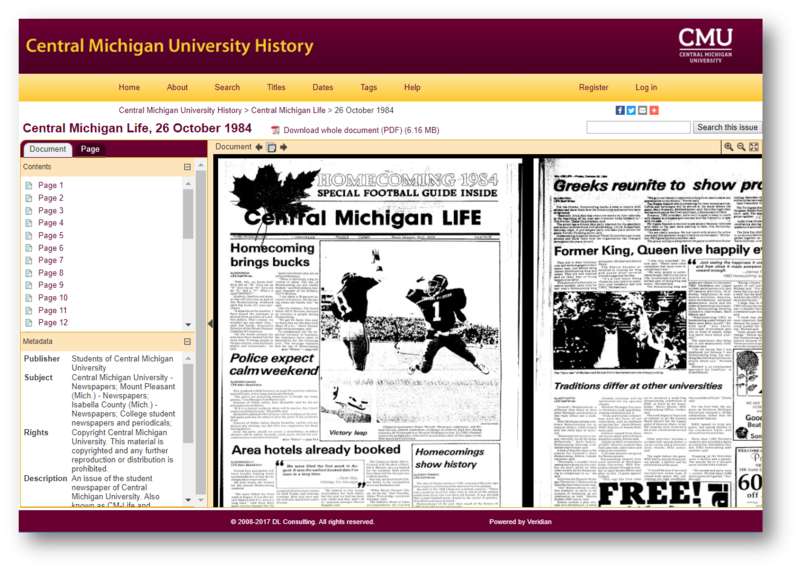 In addition to these official records, found here are also valuable, but less formal historical information such as records from the Student Government Association, the pages of CM Life and the student published newspaper’s which preceded it, the annual CMU yearbook, the Chippewa, alumni publications, and similar documents. This collection contains 5,739 documents comprising 118,891 pages. The faculty, staff, and students of Central Michigan University regularly create significant contributions to scholarship. Many of these works, including theses and dissertations written at CMU, are found here. This collection currently contains 1,099 documents comprising 86,491 pages. The Clarke Historical Library holds a large body of material documenting the history of Michigan as well as a substantial collection of children’s books. 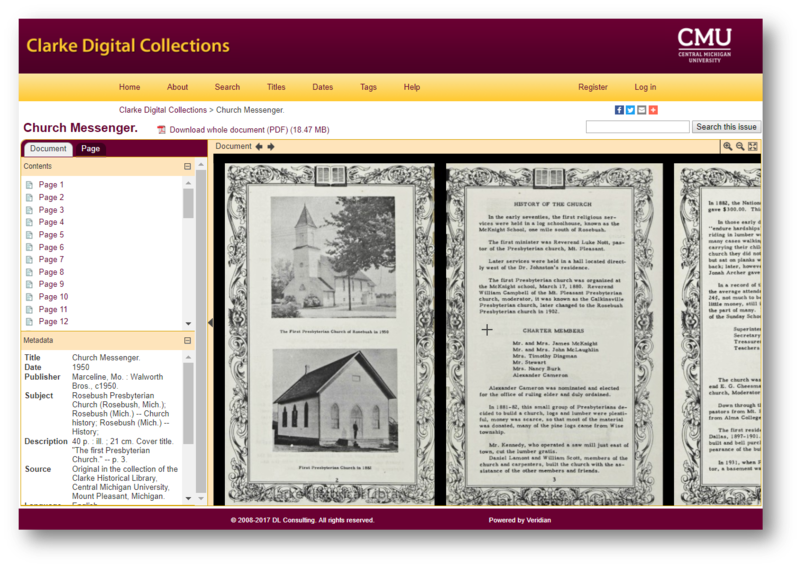 Selected items digitized from the holdings of the Clarke Historical Library are found here. This collection currently contains 73 documents comprising 6,812 pages. As much as we love our old-fashioned interface, it's time to give Veridian a 2017 look. Take a peek at some of our new interface screenshots and join us in next month's Veridian Newsletter to find out more about our new interface design for 2017.